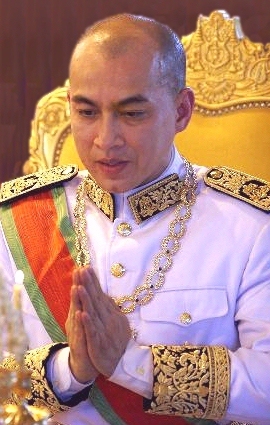 2004 H.M. Brhat Karuna Brhat Pada Samdach Brhat Paramanatha Naradharma Simhamuni Naya Brhat Rajanachakra Kampuchea [Norodom Sihamoni], King of Cambodia. b. at the Khemerin Palace, Phnom Penh, 14th May 1953, seventh son of H.M. Norodom Sihanouk], King of Cambodia, by his seventh wife, H.M. Queen (Samdach Brhat Raja Akhara Mahasuri) Naradhama Muninatha Simhahanu, educ. Norodom Sch and Lycée Descartes, Phnom Penh; Prague High Sch., National Conservatoire and Acad of Musical Art (Dipl High Studies in Art 1975), Prague and in Pyongyang, North Korea. Prisoner of the Khmer Rouge 1976-1979, Private Secretary to his father 1979-1980, Professor of Classical Dance at the Conservatoires Marius Petipa, Gabriel Faure & W.A. Mozart in Paris 1981-2000, Presdt Khmer Dance Assoc and Dir-Gen & Artistic Dir of Ballet Deva 1984-1988, Dir-Gen & Artistic Dir Khemara Pictures 1988-1993, Permanent CNS Representative at the UN 1991-1993, Ambassador to UNESCO 1993-2004, PC 2003-2004. Raised to the rank of Sdach Krum Khun 1st February 1994, and promoted to Samdach Brhat Paramanatha 31st August 2004. Elected by the Royal Council and proclaimed as King of Cambodia, in accordance with a change in the constitution allowing for the abdication of his father, 14th October 2004. Installed (but not crowned or enthroned) as Preah Karuna Preah Bat Sâmdech Preah Bâromneath Norodom Sihamoni Nai Preah Reacheanachakr Kampuchea at the Preah Tineang Tevea Vinicchay, Khemerin Palace, Phnom Penh, 29th October 2004. Assoc (Foreign) Acad des Inscriptions et Belles-Lettres 2008. Mbr High Council of Francophone Countries 2004. Rcvd: GC of Royal Order of Cambodia, and the Order of Monisaraphon, the Legion of Honour of France, Chrysanthemum of Japan (18.5.2010), Merit of the Order of St Lazarus (10.5.2008), etc. * on 20th October 2004 the National Assembly granted his father, King Norodom Sihanouk, the title of "Great King", the same privileges and immunity of a reigning monarch together with precedence over everyone in the land, including King Sihamoni. King Sihanouk continued to confer orders and decorations, receive the letters of credence of foreign ambassadors, and to preside over certain important Royal ceremonies. The practice of joint kings, where one exercises the executive powers of head of state, and another reigns and holds higher status and precedence, is well known in Cambodian history and custom. However, there seems to be no recognition of this in the present Cambodian Constitution.